← It’s the middle of the night and the smoke alarm goes off…. Home Security 101 – What is a Glass Break Detector? Most people would say that home security is built around door/window sensors and motion sensors, and that’s been true – just about every system includes both of these devices. But we also find more and more customers selecting glass break sensors to enhance a system, as an effective cost-saving device when protecting a group of windows in one room. And, unlike motions sensors, glass breaks are active in both the “Stay” and “Away” modes. Since folks are increasingly arming their systems when home at night, glass breaks could be the key. So, how does a glass break sensor work? It listens for the specific frequency that is generated by breaking glass. Glass breaks sensors are active any time your system is armed, so once you turn your system on (even in the “Stay” mode! ), you need to remember that accidentally dropping a glass could trigger an alarm. These sensors have a range of 20 feet in any direction. That means one sensor can cover lots of windows in a single room, as long as there are no doors or walls blocking the “sight” of the sensor. Clustered window areas like sun rooms are a natural spot – and one sensor is great for a room with several windows and a sliding glass door, in case the intruder breaks through the glass door. Other good areas are fixed windows (some of my windows are painted shut! 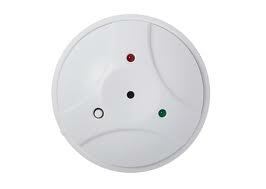 ), and vulnerable spots where my motion sensors will not be active in the Stay alarm mode. Wireless glass break sensors mount on the wall or ceiling, and don’t have to “point” at the glass they are protecting – they just need a clear “line of sight” to do their thing. Bad guys do break glass, often to reach in and unlock a window: it’s much more efficient to use a single glass break sensor than place a door/window sensor on every window in a room. They do have their downsides. If you drop a glass on the floor and break it, the sensor will go off since the alarm is based upon the frequency of breaking glass so be prepared for a call from the monitoring company!